Sree Maatre Namah — Pranaams to mother. With these words starts Latithaa Sahasranaam, or the 1,000 names of Devi. The privilege you can take with your mother, you cannot take even with your father. During the nine months a baby is inside the mother, the mother gives her own food, blood and nourishment to the unborn foetus so that it could develop into a full grown baby. During the nine months and during child-birth, the amount of fasts, hardships, worries, discomfort, sleeplessness, and pain a mother undergoes — even if you give her the whole world it is no compensation at all. Our epics, Puranas, Upanishads, etc. all extol the highest importance of a mother in society. Mother is equally revered in all cultures throughout the world. In Anna poornaashtakam, Shankaracharya says annapoorne sadhaaporne . maataa cha parvati devi, pitaa devo maheshwara. . . . That means, Shankaracharya sees Parvati as the universal mother and lord Shiva as the universal father. 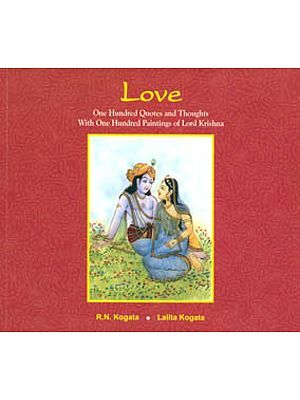 In a similar way, the Kogatas have seen Parvati and Shiva, and have beautified this book with pleasing illustrations of both of them in different activities and moods, followed by charming and delightful verses. Mr R.N. Kogata and Mrs lalita Kogata have probably the world’ creation biggest creation and collection of more than 7800 types of statues/idols and paintings of Lord Ganesha. 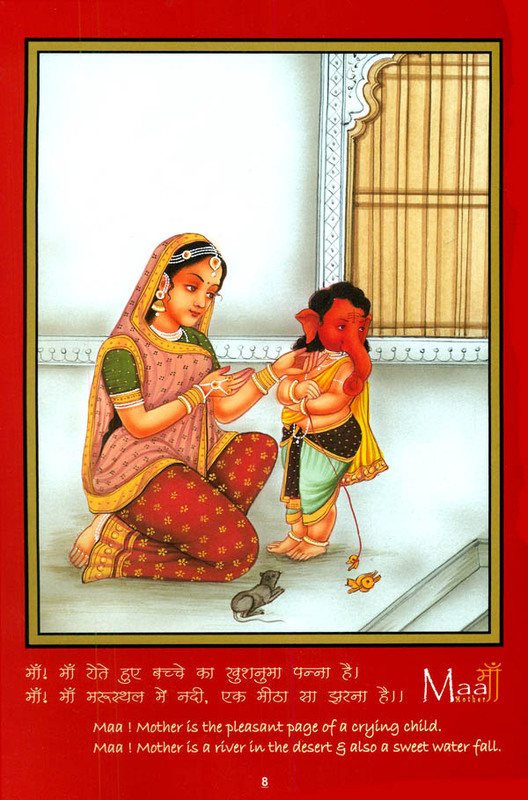 They run a Ganesha Gallery as well in Udaipur, Rajasthan. 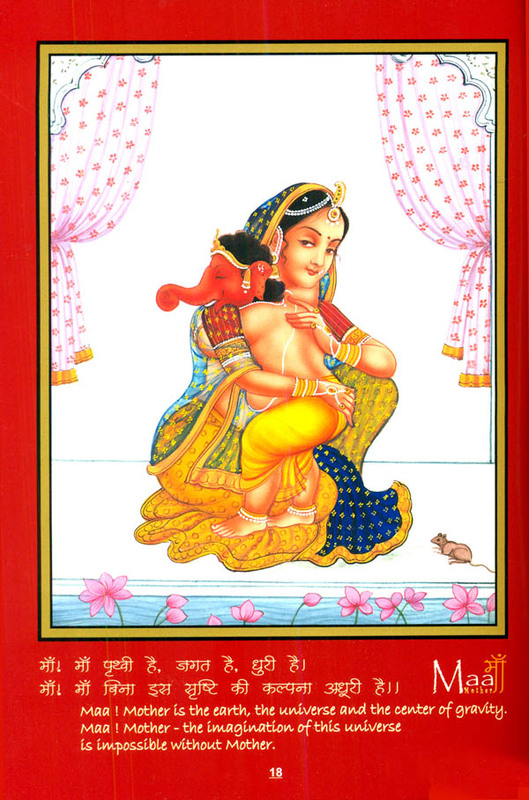 Other books authored by them are pita – the Father, Pati – the Husband in the eyes of Wife, Patnee – the Wife in the eyes of Husband, Insaan and Indian Marriage – Customs and Rituals. 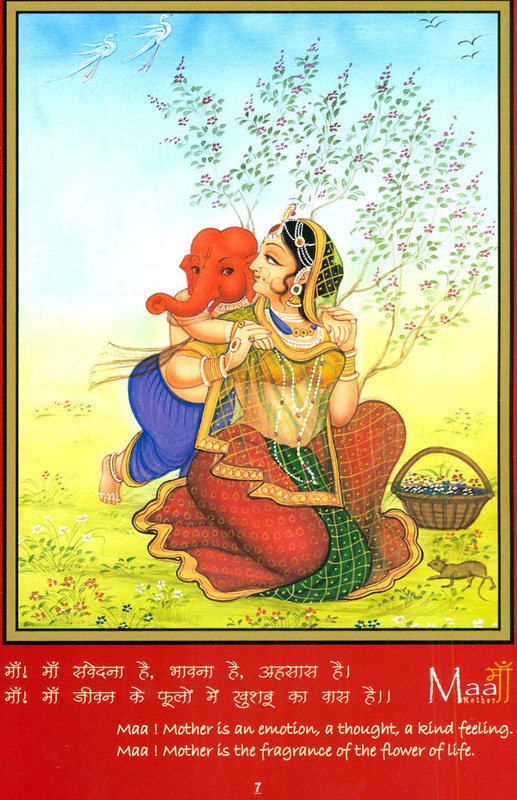 The Kogata couple have already created 1,000 different paintings of Lord Ganesha based on the 1,000 names of the elephant-faced god Ganesha as given in Hindu scriptures. Mr Kogata is a Chartered Accountant and Company Secretary by profession and Mrs Kogata is a post-graduate and a part Company Secretary. They have two sons, Devashish and Kushagra. Devashish is also an artist and has already made more than 700 pencil sketches on Lord Ganesha. Matridevobhav ! Look upon your mother as God. God cannot be everywhere, so he created Mother. A mother is the closest relative of any person and therefore it is said - ‘Tule Na Tahi Sakal Sambandhi” which means no relative can be compared with mother in any respect. A mother takes a lot of pain to give birth, bring up a child, she is the first teacher for the child, loves her child in all circumstances, saves her child from all the evils and Mother is the first word spoken by anyone in the life. Suktimala, 593 describes five women as Mother — own mother without whom anyone’s existence is impossible, your wife’s mother who gives her daughter for life to you, the wife of King as he is said to be representative of God and protects people, elder brother’s wife as she acts as Mother in the absence of your own Mother and teacher’s wife as teacher is like God as described in Hari-Hara Subhashita, 3.3. Maa — Mother! this word not only gives great feelings and reflection of sweetness of love, affection, respect, blessings, faith, belief, mercy, kindness, warmth and so on but also gives heroism and fame and is the symbol of sacrifice and penance. For Mother, her child always remains a child at all ages may it be Human or God. Mother is the name for God in the lips and hearts of little children. Mother is compared with Tridev - Brahma, Vishnu and Mahesh. The success of any person has compulsory ingredients of moral, intellectual and physical education from the Mother. What mother does for us cannot be done by anyone else and no one can replace Mother in any way. Inspired by these heart-touching facts, we did a small attempt in 2004 with the blessings of His Highness Shreeji Arvind Singh Mewar in the form of a book on “ Maa – the mother” to express our thoughts about Mother and we would always be grateful to Dr M.L. Swarankar, Chairman, India Education Trust, Jaipur for his whole hearted support. We are also grateful to all our well wishers and readers, who have made the first and second edition a great success and have given us an opportunity to come out with this third edition of the book so quickly. Our real success are those heart touching letters, which we have received from some of our readers expressing their view that this book has totally changed their thinking and respect towards the mother, which they could not fully realize before reading this book. We feel that if we can change even few people the God has fulfilled our wishes and object. We prostrate before our parents for their beloved blessing for reaching this stage. We are also thankful to learned Poet Shri Om Vyas “Om” from Ujjain for his poem on Mother. He is an internationally known and renowned Poet writing since 1970 and besides whole of India, he has presented his jewels of poems in USA, Dubai, Sharjah and Nepal also. As usual, with the expectation of blessing from all of you.